Sometimes I like to play around a bit with my food. Making pretty looking and tasty breakfast is my thing, so I decided to do the same with my lunch. Now that it's spring, I like eating big fresh salads for lunch. Instead of tossing all the vegetables together, you can also arrange them by colour like a rainbow! (slightly OCD-style but hey) I got this idea from Rens Kroes, who says that the more colour you have on your plate, the more variation in nutrients you're getting. So this rainbow salad doesn't only look great, it's very nutritious too. Win-win. I like it! You can essentially use any kind of vegetables you like, as long as you have a range of different colours. I decided to only use raw veggies (apart from the beetroot), but you can also include (leftover) cooked vegetables like pumpkin or roasted tomatoes. I chose to keep my salad mostly raw! Cut the vegetables into bite-size pieces and use a potato peeler to make carrot ribbons (you could also use a spiralizer or julienne peeler). 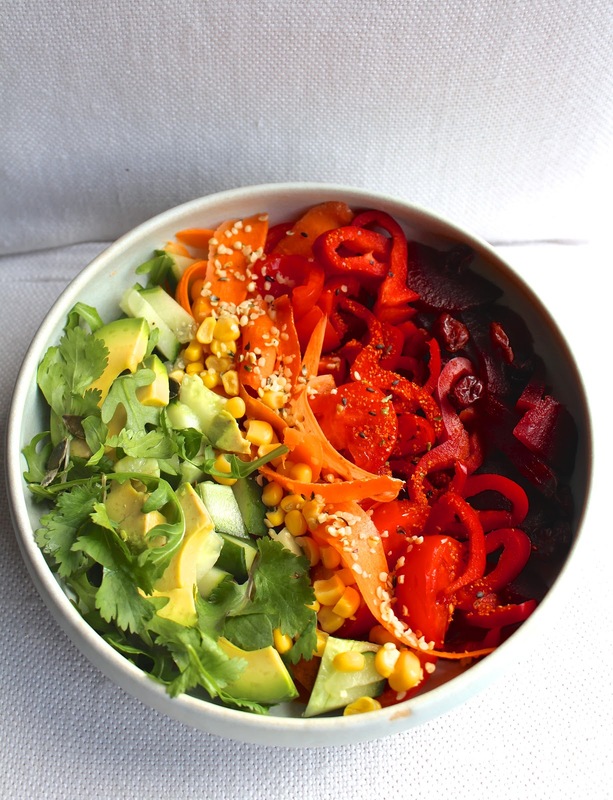 Arrange everything in a shallow bowl by colour, and sprinkle with any toppings you like. Top with a drizzle of olive oil and lemon juice. If you want, you can make a special dressing with honey and mustard for example, but I decided to keep it simple. This is a little bit more work than a regular salad but super tasty and so colourful you can't help but be happy when eating it (and become one of those smiling salad-eating people). If you're having a friend over for a light lunch this will definitely impress (or even kids!) Plus it's very Instagrammable. Reasons enough to try this recipe I'd say!